One of Kickstarter’s most heartwarming success stories came to a satisfying conclusion this week, as LeVar Burton’s effort to resurrect Reading Rainbow—the PBS show he hosted for 23 years—as a digital series, met with resounding success. After raising a million dollars in the first day, Burton raised his goal to $5 million, which he reached (and then some) with the help of some of his Star Trek co-stars, not to mention the more than 100,000 people who donated to the cause—a Kickstarter record. 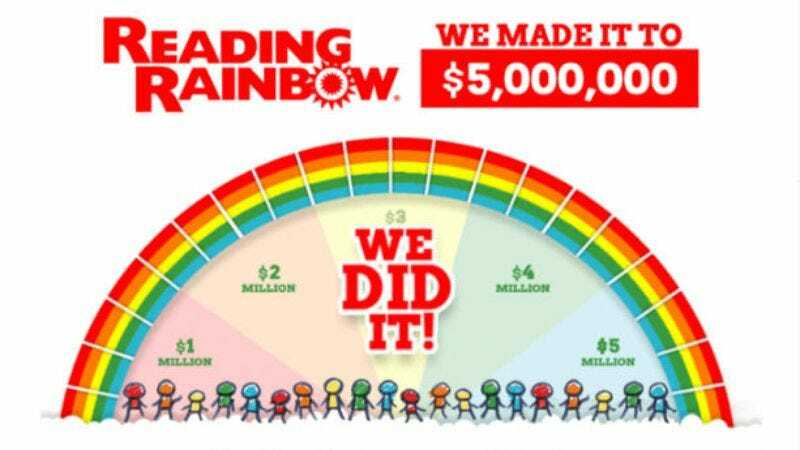 Rainbow also got a sizable assist from Seth MacFarlane, who promised to match donations of up to $1 million in the effort’s final week. The Internet rose to the occasion, raising that much in one day, earning MacFarlane the deluxe Kickstarter reward of helping the public forget A Million Ways To Die In the West. The new version of Reading Rainbow will exist as a website and app intended for use as a classroom aid and to encourage kids to read at home. The funds raised will allow Burton and his team to distribute the app to classrooms for free, so $6.4 million is going to add up to a lot of encouragement for a lot of kids.